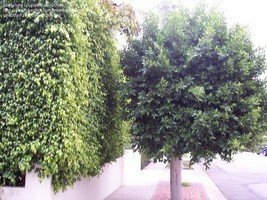 Probably the most commonly grown tree indoors throughout the world is the Weeping Fig, Ficus benjamina. 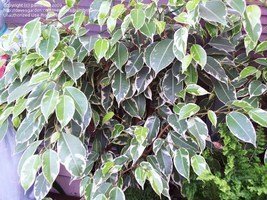 Surprisingly, despite its amazing popularity and ubiquitous presence, it is not what I consider an 'easy' indoor plant (then again most plants for me are not easy indoors). 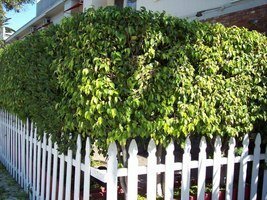 But if some general recommendations are followed, and one goes through a bit of trial and error, this species can make an excellent house or patio plant. Outdoors it is one of the easiest trees to keep looking perfect ... as long as it's planted in the correct climate. 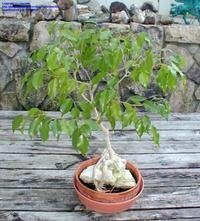 The following article will serve as an introduction to this versatile tree, as well as a guide on how to grow it and care for it, both indoors and out. 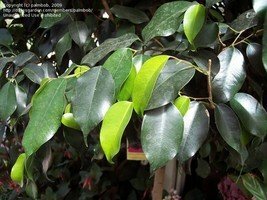 I can hardly think of a hotel, mall or nursery where I have NOT seen a Ficus benjamina. 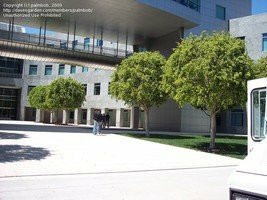 At least in the United States, these are ubiquitous trees indoors, and extremely common outdoors in the warmer climates (9b and above). 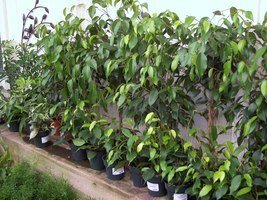 This species of fig tree is popular because it is easy to reproduce, and therefore cheap, it is very adaptable in terms of light, soil and weather, it grows with minimal care both indoors and out and is very ornamental (when grown properly). 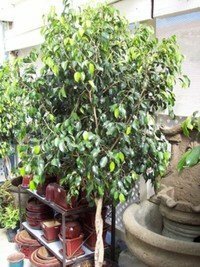 Ficus benjamina is just one of hundreds of species of Figs, dozens which are very common in cultivation. 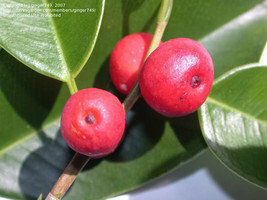 However, this is probably the most common of all the Ficus species since it has so many uses. Figs are members of the family Moraceae, a huge family of plants with over 1000 species. 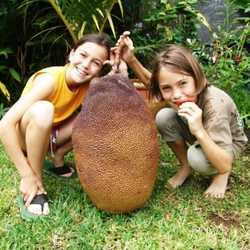 A few other popular genera in this family include the Mulberrys and the Breadfruit trees. 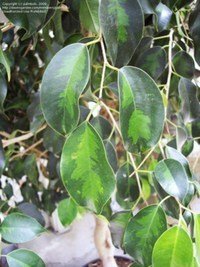 Most Moraceae are tropical plants, and Ficus benjamina is no exception, being native to the tropics of south Asia and northern Australia. Weeping Figs are characterized by having ovoid, shiny green leaves that taper distally to a dull point. The leaves droop ornamentally and that's where this tree gets its name from. 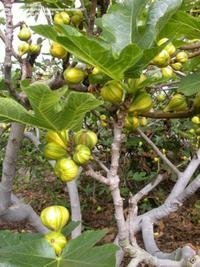 There are numerous other ornamental figs grown commonly but only this one has the shiny, drooping thin leaves with the tapering tips. 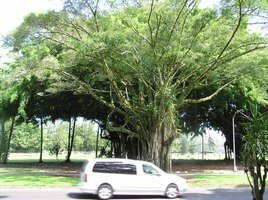 The trunk is somewhat pale and smooth and can grow to several feet in diameter in larger older trees in non-tropical climates, but as much as a dozen yards or so in diameter in tropical climates. 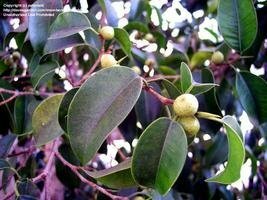 As with most other Ficus species, Ficus benjamina has white, latex-like sap. 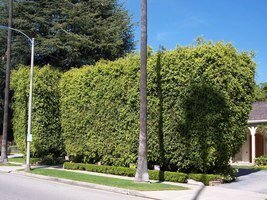 Outdoors: In its native countries, and in all other tropical locations where it is grown, this plant can grow up to nearly one hundred feet tall and can form massive banyans with leaf canopies hundreds of feet in diameter. 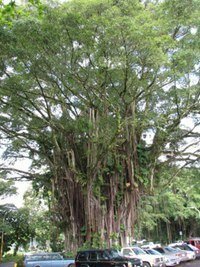 In Hawaii, where I have seen these as huge Banyan trees, they develop massive pillar-like trunks with huge, invasive root systems that travel along the surface, or just under it, for almost as many yards outward as does the massive leaf crown. 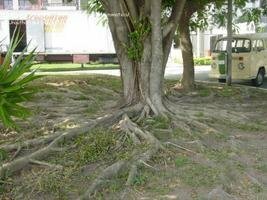 Aerial roots form rapidly in this warm, humid climate, and these roots, when they finally grow down long enough to touch something, will root and grow into one or several additional massive trunks allowing the tree to grow outward seemingly indefinitely. These aerial roots will even form a trunk if they simply droop down to a branch below, as they grow or ‘melt' into the branch's tissue and eventually become seamlessly connected to it. These melded roots, branches and trunks create amazing and awesome natural sculptures. 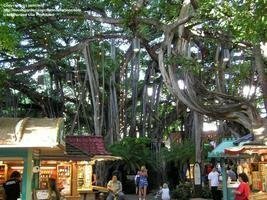 One particularly old tree that exists in Waikiki beach, takes up nearly a whole city block and a large shopping area has been created under it with buildings and walkways threaded between and among all the aerial roots/trunks. 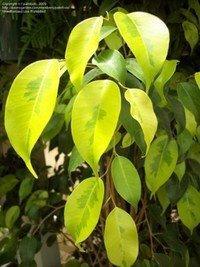 In tropical climates, where there is no cold, plenty of water, and the soils are fairly well draining, this tree is so easy that it takes no care at all, other than containment (which can actually be quite a bit of care). 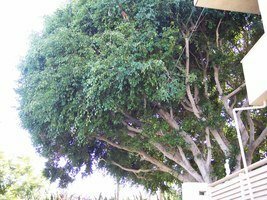 However, in a more arid climate, such as where I live in southern California, this tree does not usually develop into a goliath Banyan. 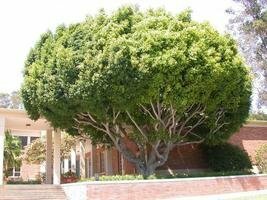 Old trees can become pretty large in a Mediterranean climate, and if near the coast where the humidity is higher, they can develop into fairly large trees. 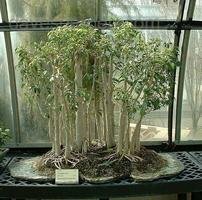 However, one rarely sees them successfully develop aerial roots or develop banyan-like trunks. 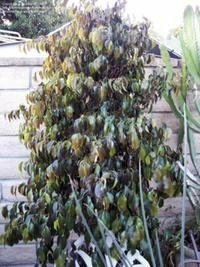 In my southern California climate Weeping Figs looks somewhat ‘ordinary' with a single thick pale trunk and a relatively spherical crown of leaves. 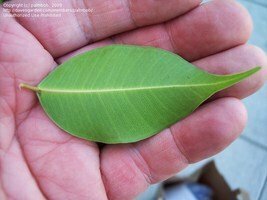 I still think these make very ornamental trees, however, as their leaves droop attractively, and are always shiny and bright green (often with a nice variety of light and dark greens since the newer leaves are lighter in color than the older ones) year round (not a deciduous species). 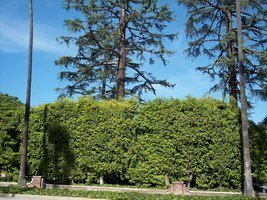 As a landscape plant, this species is very malleable, not just serving as a large natural specimen tree, but also as shaped structure, from an angular hedge, to a tall, flat wall or visual barrier, to a sculpted, pruned shape of any size, even as a topiary. 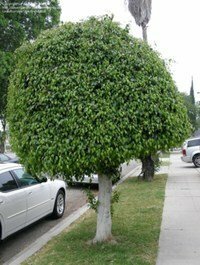 This species, along with the similar looking Ficus microcarpa, is used extensively throughout southern California in the urban landscapes as a hedge or topiary plant as it tolerates pruning quite well and has a nice dense crop of leaves that can be created into an excellent sculpted shape. Even cut to the ground it grows back reliably and rapidly. 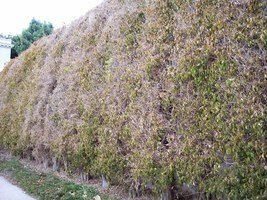 Most plants in the ground will rebound from devastating freezes that completely defoliate these trees and even kill most of the above ground wood as long as they maintain a healthy, undamaged root stock. For visual barrier growth, most landscapers seem to plant these just several feet apart (much closer than is really necessary) as root crowding does not seem to bother this species much. Outdoors this species tolerates a wide variety of conditions, being moderately drought tolerant, but also happily absorbing very heavy rainfalls or overwatering (something it does not tolerate indoors well). It is cold tolerant down to about 28F and seems to deal with high heat over 120F as long as it does not dessicate or forced to exist in extremely low humidity. 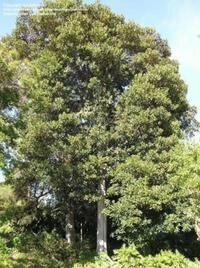 These trees grow well in full sun to full shade, looking best with at least some bright light. 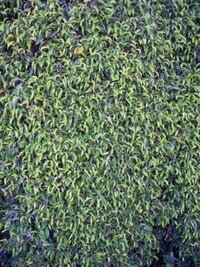 For a dense leaf look such as desired if pruned into a hedge or topiary, half day sun to full sun is recommended. 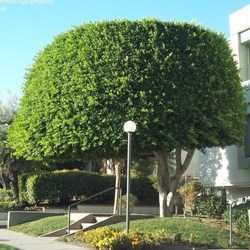 Ficus respond quite well to frequent fertilization, but also tend to look healthy for years without any fertilization. Once established, they are generally quite drought tolerant in all but the most hot and arid climates. Outdoor problems include freezing, severe drought, high winds (leaf loss), and bugs (primarly thrips). 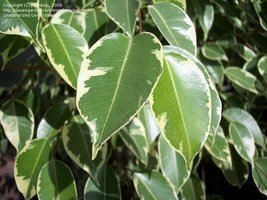 Ficus benjamina has numerous cultivars available in cultivation differing either in waviness or color (including variegation) of leaves, leaf-drop tendency and overall size. Be sure to look about the web before just getting one at a local nursery in case some of these newer cultivars fill your needs better than the standard form does. 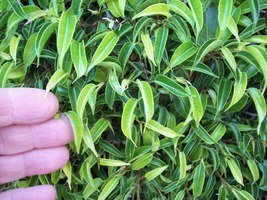 This link is a good site that goes over many of the cultivar descriptions. 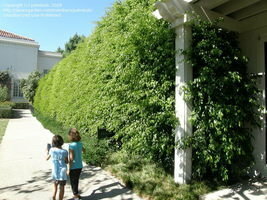 Unknown Ficus benjamina cultivar in Los Angeles with leaves about 1/3 the size of normal, but plant itself not dwarfed. 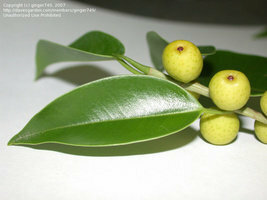 Ficus benjamina is a fig, but the fruits are pretty inedible (though not toxic) and fairly small. I rarely even notice them in the southern California trees and it may be that fig production needs more humid heat than we get here, though once in a while I notice fruit in some trees. 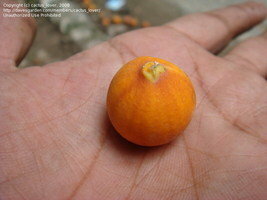 Fruit forms twice a year in the warmer, tropical climates and fruit drop can be a messy problem in those climates. The leaves are also non-toxic and are even considered nutritious additions to the diets of some herbivores. 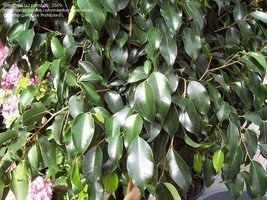 I have read that deer avoid Ficus benjamina leaves, but I have no idea why if that is the case. Certainly rabbits seem to like them. 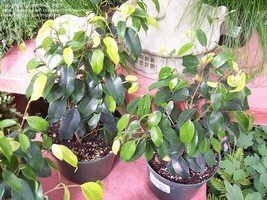 Ficus benjaminas are excellent choices as plants to grow in reptile terrariums because they are safe and have edible foliage. Indoors: This is completely different plant indoors, tending to stay relatively small (though pruning is eventually needed to keep it from getting too large), delicate and less densely foliated. Indoor plants tend to have darker leaves and lighter colored stems. Plant in well draining soil- drying out is much less of a problem indoors as is overwatering, and if soils are not well draining, overwatering is easy. 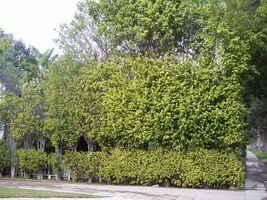 For this reason, it is recommended to repot these trees every few years as soils eventually become compacted as they settle and the plant's rootballs become more dense as well. Water trees only as needed (when the soil feels dry several inches deep). Potted plants outdoors can be watered much more often as the higher humidity and light levels outdoors stimulate more active growth. 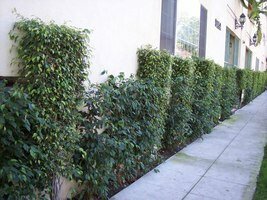 It is much harder to overwater outdoor plants. 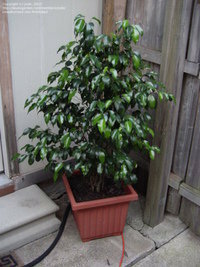 In fact, underwatering is more of a concern for outdoor potted Ficus benjaminas. 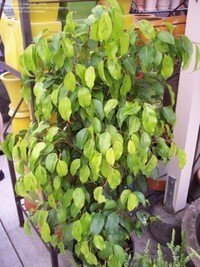 Since most plants are sensitive to tap water chemicals, and Ficus benjamina is no exception, it is recommended that, if possible, these be watered with distilled water, or water treated by reverse osmosis. Do NOT use water that has been softened as that water has a very high salt content. 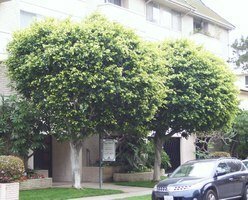 These trees, like many indoor plants, benefit from a good ‘flushing' of the salts out of the soil one to two times a year. To do this, take the tree outside (when it's warm) in a shady spot and flood the soil with water several times to leach out the accumulated salts. Keep plants in as high a light situation as possible without being in too much direct sunlight. Though this species tolerates very low light situations well, eventually the lack of light will cause the tree to lose a lot of leaves and look very anemic. Direct sun indoors means the plant will be exposed to a lot of light extremes and these plants don't like a lot of changes as indoor plants. Even light, even temperature, even air flow, even watering etc... variation is this plant's enemy as an indoor creature. Also short term direct sun will burn new leaves that in a low humidity situation, as is usually the case indoors. Ideal temperatures have been list between 75F- 85F during the day (24C-26C) and 10F-15F cooler at night (60F-70F, or 18C-21C). 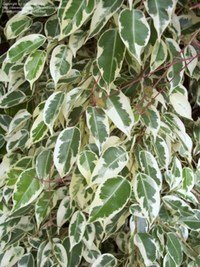 Though these plants can tolerate freezing outdoors, indoor plants are much less tolerant of such extremes and would certainly defoliate. Fertilize monthly in warmer, sunnier seasons with a dilute, water-based fertilizer, and stop as day lengths get short (mid fall through mid spring). Misting the leaves is not essential, but highly recommended. High humidity is good for the overall health of this plant. Cleaning the leaves frequently by gently wiping off the dust is also recommended. This not only makes the plant look better (glossier) but also keeps the leaves ‘breathing' well. Most recommend keep out of drafts as these represent variations in ‘indoor weather'. 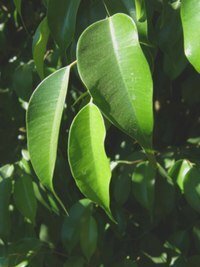 Again, Ficus benjamina likes things to always be ideal AND the same. Problems indoors: 1) as already discussed, overwatering is probably the number one problem with these as indoor trees. The higher the light and humidity, and better draining the soil is, the less overwatering is likely to occur. 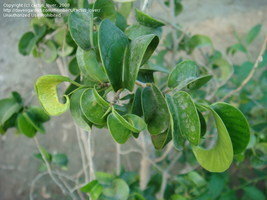 If overwatered, leaf loss will occur, particularly on the lower leaves. Overwatering can lead to root rot eventually, and then one might lose all the leaves, and the entire plant as well. 2) Change- variations in light, heat and watering schemes will often result in leaf loss. Once a plant seems to have adapted to a certain area in the house, it is best to leave it there. 3) Bugs- indoors these plants are prone to the usually array of indoor bugs. Low humidity will allow spider mites to damage the leaves. Frequent misting will decrease the chances of this problem. Mealy bug can be associated with excessive misting and too low light levels for too long, though mealy bugs seem to attack just about any tree if given the opportunity. Safer soaps and neem oil works well for these. Thrips are rare indoors, but will cause a characteristic leaf curl (see photo above). 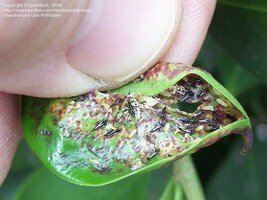 I think most systemic insecticides will take care of these. 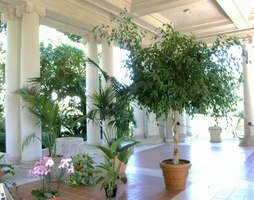 4) Underwatering- this happens less often than the opposite situation, but occurs when indoor plants become so much of a part or the background that one forgets they are there. 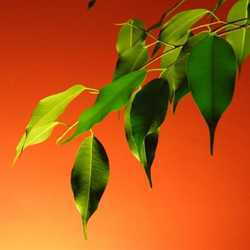 They will remind the owner, however, by losing leaves (a Ficus's response to just about anything that goes wrong). 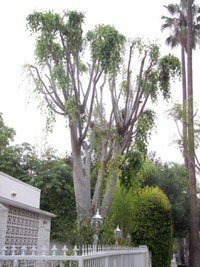 Insufficient watering is also common for tree owners who have killed one by overwatering. 5. Seasonal leaf loss: this species seems to lose leaves every winter, indoor or out (though it seems to be more noticeable indoors since the plants are smaller and leaves on the floor are more evident. This leaf loss is also a good reminder to maybe start watering the plant less often. 6. Rootbinding: though these seem to tolerate root binding more than most trees do (one reason they do well in pots for so long), they still can become excessively root bound. I have read that root pruning should be done about once every 5 years, though I admit to have never done that myself. 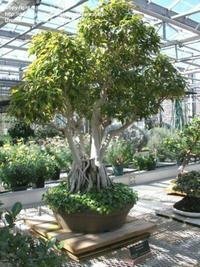 Ficus benjaminas as Bonsai Trees: This is probably one of the very best and easiest bonsai trees for beginners (like myself) despite it's apparent ‘touchiness' indoors. The beginner may go through a lot of learning curves and subsequent leaf loss, but the Ficus species are some of the most tolerant bonsai plants when it comes to forgetful owners (again, myself). If I forget to water mine, it is somewhat forgiving compared to just about any other bonsai species I have tried in the past, all which immediately die if not watered on time. 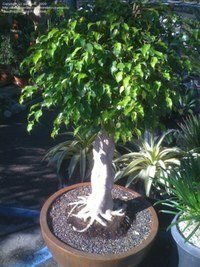 And most plants in a good bonsai pot with the proper soil (rich but draining) are pretty hard to overwater. Growing these outdoors in a bonsai pot is extremely easy... indoors they one must follow the above recommendations with the following additions: water more often (daily in summers for example); repot every 2 years; root prune each time repotted once roots get too large. As for shaping and artistic touches, that is far beyond my expertise and one should consult a bonsai specialist or website on bonsai. 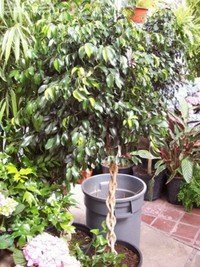 Introduction to Ornamental Figs in Cultivation The Finicky Ficus Benjamina This season's fruit ; Artocarpus heterophyllus, The Juicy Giant Jackfruit.